The first poster for Detective Pikachu is here. Pokemon is one of the most popular entertainment brands on the planet and has been going strong for more than two decades at this point. Over the years, we've been straight-up lousy with animated movies, shows and all kinds of merchandise. But for some reason, it's taken a really long time for someone to actually pull the trigger and make a live-action Pokemon movie. Now, it's finally coming our way with Detective Pikachu next summer and we have our first look at the movie's logo, thanks to this poster. 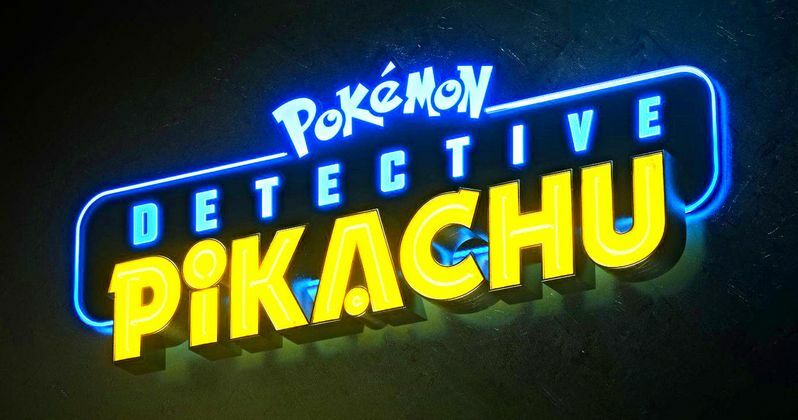 The poster features an all-black background with a neon sign logo for Detective Pikachu. Pokemon is proudly displayed above the movie's title, with both Pokemon and Detective bathed in blue neon. Appropriately, Pikachu is yellow. Beyond that, it just boasts that the movie will hit theaters in summer 2019. The logo design feels like a classic sign that might be displayed outside of a detective agency in a crime drama, which make sense, given what we know about the plot. While we don't have a full synopsis, the first ever live-action Pokemon movie will center on a teenager whose father is kidnapped. That leads him to Pikachu, who in this movie plays a detective and is voiced by Deadpool star Ryan Reynolds. They team up with a young journalist in order to solve this missing persons case. The cast, in addition to Reynolds, includes Justice Smith (Jurassic World: Fallen Kingdom), Kathryn Newton (Big Little Lies), Ken Watanabe (Godzilla: King of the Monsters), Suki Waterhouse (The Bad Batch), Rita Ora (Fifty Shades Freed) and Bill Nighy (Pirates of the Caribbean: Dead Man's Chest). It's noticeable that a release date isn't featured on this first poster. Legendary Pictures had a deal in place with Universal, who was set to partner for the project. However, some shuffling has resulted in Legendary teaming up with Warner Bros. again, who will now be handling Detective Pikachu. Since the movie has switched studios, it's possible that the previously announced May 10, 2019 release date has shifted. But it's still going to be released roughly in that same timeframe, as the poster clearly states "summer." Goosebumps director Rob Letterman is at the helm for the Pokemon adventure, which has begun shooting. He co-wrote the screenplay with Nicole Perlman, who previously worked on Guardians of the Galaxy and the upcoming Captain Marvel for Marvel Studios. One might not have thought that Detective Pikachu, which started life as a Pokemon mobile game, would be the subject of the franchise's first live-action movie. But they have assembled a great cast and a summer release date implies a good deal of confidence in what they've got. We'll have to wait and see once the trailer drops. Be sure to check out the movie's first poster, courtesy of the Detective Pikachu Twitter account, for yourself below.